Affiliate disclosure: Thank you for reading Family Rambling. Please know I partner with companies I use and trust as an affiliate and, when you make a purchase I will (in most cases) receive a referral commission. Your costs will not be higher when you make a purchase through my links, and your purchase helps support the costs of maintaining Family Rambling. Thank you! Go Bag : the bag you keep packed for family outings. I actually thought that once my girls were old enough to schlep their own stuff that I wouldn’t need a ‘go bag’. I foolishly thought that the kids would carry the things they might need. I found that a big part of choosing a go bag was picking a bag that was not only functional, but one that my girls would carry. Because our outings can vary between biking and driving, I have 2 bags at the ready – the abundantly pocketed Zip Top Organizing Utility Tote and a backpack. They sit next to each other, one filled, and are easy to swap if needed. Each bag is large enough to hold everything I deem necessary for our outing, plus a few extras. Each is easy to carry, and (most importantly) super cute! Thankfully tweens require a lot less than younger children – but now I require a bit more as I don’t have to keep an eye on them continuously. 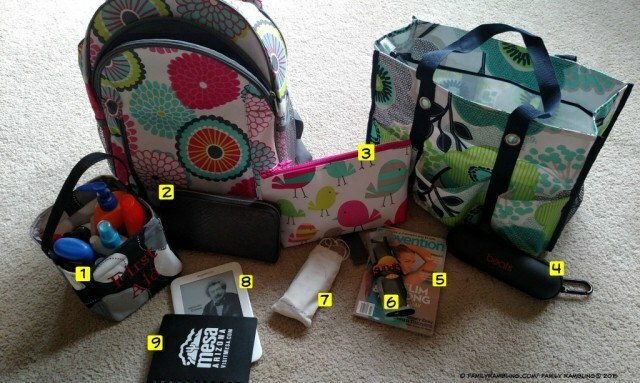 These items live in my Summer Go Bag – I always know where they are if I need them and replace them when I’m done using. 1) First Aid – sunscreens, bug sprays, band-aids, and other first aid items. They are all in their own small caddy to keep them together and easy to access. 2) My wallet – I use a large wallet that can double as a clutch as I rarely use a purse in the summer. If I need to run to the store I just grab the wallet, tuck my phoone in it, and go. 3) A small thermal – kids always want food! To keep costs down while we’re out, I pack small, healthy snacks like cheese sticks, trail mix, and fruit. 4) A speaker – this is especially useful on bike rides or picnics. I use Spotify on my phone and keep our favorite tunes downloaded to avoid streaming costs. 5) A magazine – a smart choice if we’re someplace with water as kids really aren’t that careful when they come back to beg for food. No point ruining your electronics! 6) Sundials Sunglasses – my eye doctor recently recommended that I wear ‘readers’ for computer work and reading. But they aren’t really great when reading outdoors! These adjustable lens sunglasses are perfect for poolside reading! I also love that they can adjust to see more clearly farther away and don’t cost a fortune – in case you’re the type to misplace sunglasses. 7) Portable charger – just in case tweeting, Instagramming & Facebooking drains my cell phone battery…. 8) Kindle – as much as I love my tablet the back-lit screen is just really difficult to read in the sun. The basic Kindle is perfect for outdoor use. Of course we will add other items depending on our activity, but I find that keeping these objects packed & ready helps us get out the door and on to the fun faster! Do you have any summer items you never leave the house without? What would you add to my list?